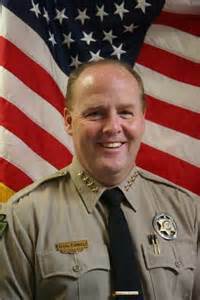 We are thrilled and honored to announce that Mark Dannels, Sheriff of Cochise County, has agreed to speak at our September 17th meeting. Sheriff Dannels has told Roberta Heine, 1st Vice President—Programs, that he has agreed to speak to members of Palo Verde Republican Women and their guests, not to entertain us, but because he believes it is IMPERATIVE that we learn the truth about the lawlessness taking place at the U.S./Mexico border. And since the media and our government are hiding the truth from us, Sheriff Dannels feels that it’s his duty to speak directly to the American people. According to Sheriff Dannels, our country is in a lot of trouble because of what’s happening on our southern border. And it’s doubtful that there’s anyone in a better position to share with us what’s really happening. As THE sheriff responsible for ensuring public safety along 85.3 miles of shared U.S./Mexico border in Cochise County, Sheriff Dannels knows EXACTLY what’s going on. And he’s going to tell us, so that we can help spread the word. So invite your friends, your neighbors, and anyone else that wants to know the truth! The sovereignty of America is at stake! To RSVP, contact Edith Stock at 480-298-7818 or at our new reservations email: pvrwlunch@gmail.com. The menu is yet to be determined, but we will share it with you as soon as it has been decided.